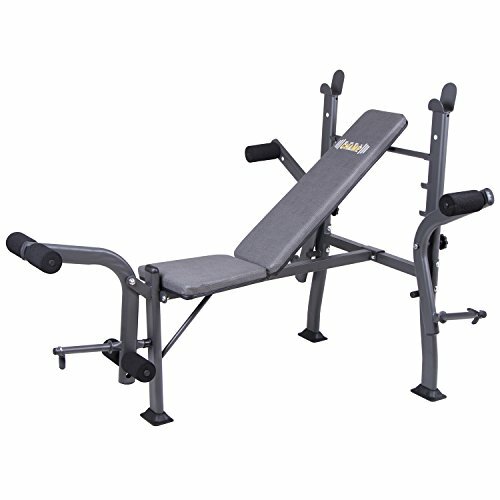 Ideal for beginners and those who are looking for compact design, this 28-inch standard weight bench can accommodate both a 5' and 6' bar and weight set. The high-density foam back cushion can be adjusted for a flat and multiple incline lifting positions. Add versatility to your workouts with the butterfly attachment which allows you to exercise the outer pectoral muscles, unlike most simple bench presses which do not have this added feature. The dual-action leg developer is fitted with comfort-density foam rollers for added comfort to your leg extension and leg curl sets giving you complete tools to also target your lower body muscle groups.